The problems continue at Western Greyhound : It is with considerable reluctance, as a result of an unprecedented driver shortage that we are forced to suspend some rarely, or lightly used late afternoon or evening journeys on Mondays to Saturdays for a period of time as we seek to recruit new drivers. We have carefully selected the journeys to cause the minimum of disruption to our passengers. The services affected are the 521, 529, 555, 556, 587 and 597. In many cases it is only 1 or 2 journeys on each service that will be affected. 521 - Newquay - St Dennis - St Austell The following journeys will be suspended from Monday 20th October 2014 until further notice. 1925 from St Austell to Newquay via St Dennis 2030 from Newquay to St Austell via St Dennis 2330 from Newquay to High Street via St Dennis. 529 - Bodmin - Roche - Bugle - Penwithick - St Austell The following journeys will be suspended from Monday 20th October 2014 until further notice. 2125 from St Austell to Roche and the 2200 return from Roche to St Austell. 555 - Padstow - Wadebridge - Bodmin - Bodmin Parkway Station The following journeys will be suspended from Monday 20th October until further notice. 1830 from Padstow to Bodmin Parkway and 1930 return from Bodmin Parkway to Padstow. the 2030 from Padstow to Bodmin Parkway and the 2210 return from Bodmin Parkway to Padstow. 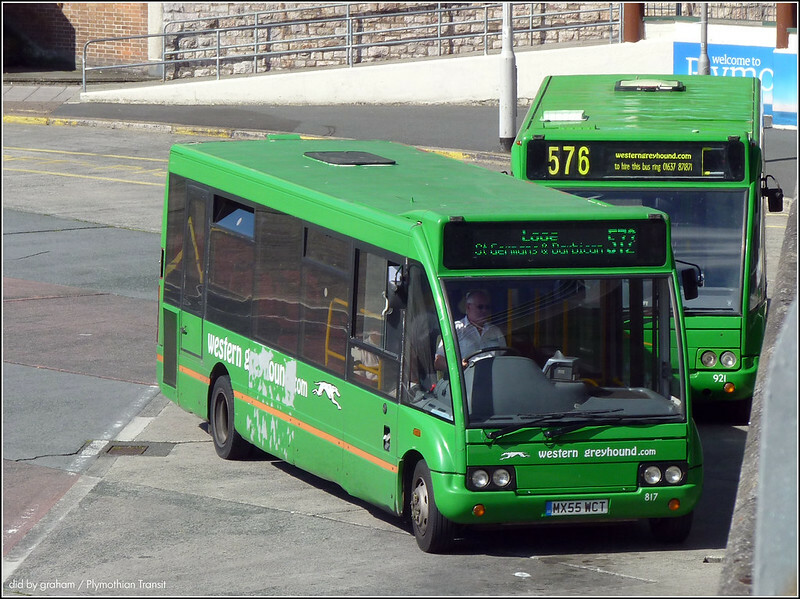 587 - Newquay - Perranporth - St Agnes - Truro The following journeys will be suspended from Monday 20th October 2014 until further notice. The 1905 from Newquay to Truro via Perranporth, and the 2205 from Newquay to Perranporth. DENNIS BASFORD: ‘Scene’ in Derby, ‘Kinchbus’ Mercedes-Benz Citaro’s The following images were taken today in Derby (17th. October 2014). They really are lovely buses. FOCUS TRANSPORT: Government Reveals Plan to Sell off the UK's 40% Stake in Eurostar The chancellor will say he is looking for bids by the end of the month and is hopeful the privatisation of the Channel tunnel train operator will raise up to £300m. Doubts Expressed About Driver's CPC Following an investigation by the Transport Select Committee here doubts are being expressed by MP's about the effectiveness of the Driver's CPC. Currently all new professional PCV &HGV drivers must pass an initial qualification, and all existing professional PCV & HGV drivers must take periodic training on a five-yearly cycle. New Tube Trains Revealed The Mayor and London Underground (LU) have revealed stunning new designs for the 'New Tube for London' - the next generation of Underground trains, which will come in to service from the mid-2020s. IAN VISITS: 200 years ago — the London Beer Flood 200 years ago a tsunami wave roared down several streets in central London laying waste to the area and drowning a number of people. The tsunami wave was made of beer Weekly round-up of London’s railway transport news Tube passengers left ‘screaming in terror’ as window ‘explodes’ on Piccadilly Line 60 mini Boris Buses to be deployed across London A display of some of the 60 new mini Boris Buses took place in central London this morning causing more than a few heads to turn and people to point and giggle at the sight. Disused tube station tours to resume in January Next January, the public will be let back into Aldwych tube station for guided tours led by the Transport Museum. LANCASTER OMNIBUS: Bus User Group Launch Sparks Media Frenzy The projected launch of a Bus User Group for Lancaster has led the Lancaster Guardian newspaper - on what was obviously a slow news week - to lead with a front page splash attacking Stagecoach's fares policy and service delivery in the city. NORWICH BUSES: Dominating Norwich "there is only one in service and that's at Greatt Yarmouth, the others have been black listed by the unions for diesel fumes within the bus" 33163 returns in the new Norwich livery As I'm sure you are all aware, First Norwich have begun to paint the fleet into their new livery, which features bright colours at the front and on the rear (depending on route colour branding) as well as corporate colours towards the rear of the vehicle. PUBLIC TRANSPORT EXPERIENCE: An Open Letter to the Minister  It is worth repeating the fbb mantra for journey planners. You can either be comprehensive or comprehensible, never both. Try to include all options and you will, inevitably, increase confusion and lead customers into unworkable journeys 1952 : Pub Crawl and Public Transport As part of his own downsizing he has supplied fbb with some really juicy timetables for areas of the chubby one's particular interest. This reduction of clutter c/o Clive has now increased clutter c/o fbb towers much to the chagrin of the domestic authorities! But what superb clutter it is! TRANSPORT ILLUSTRATED: Exeter The subject of my last report, the bus rally at Paris Street, took place on a Saturday so it was 'business as usual' in addition to the heritage buses and coaches. Here's a selection of some of the current buses and coaches that I also saw. Dear oh dear can this company get any worse ? I think this is going to be a long painful death for this company, and this as they feel the heat from competition from First on many of their routes soon. Surely it would be more humane to put this company out of it's misery ? Sad as WG were once a great bus company showing the big companies how to do it. How times change! I think anyone could have done the same good job a few years ago whilst First were on a mission to destroy themselves. Not so easy now First is fighting back strongly. Surely VOSA must be sniffing around WG by now? And the picture shows the lack of a destination display on the 576 bus behind - something else which would not impress the Traffic Commissioner. If vosa are not sniffing around WG there is something wrong.. There are just too many failings and this is final straw..breach of contract. I don't fancy their Chances of re recruitment either. It doesn't seem a permanent job does it? Their browbeaten staff have pretty much remained loyal, but things came to a head just over a week ago, and large numbers have started or agreed dates to start with First. First left them alone for a fair while until other operators started to pick over the bones but must have decided that that was the time they had to take action to protect their own interests in the area and are now set to sweep back across central Cornwall starting in two weeks time. WG still blame everyone and everything else for their woes but it's interesting that First aren't complaining about the Council in general, tenders, concessionary fares, the weather, or the reliability of Darts and Tridents. The death throes of Greyhound are painful to watch. It does look like it's time to put the old dog to sleep. Are they allowed to do this? Surely the traffic commissioner should intervene? Strictly speaking, no, of course they're not allowed to do this. But I guess we have to assume that WG has liaised with the TC and with VOSA before taking this action and they have permitted it. Anon @ 18:52 wonders if the journeys are commercial or tendered - good question, similar situations elsewhere have seen operators' tendered routes/journeys covered at the expense of commercial ones, lest the various Councils threatened sanctions or cancellation of contracts etc. If the journeys are commercial and as lightly used as suggested, then as mentioned, why has WG been still running them? The big question is has WG tried to get other operators to cover these journeys or hire in drivers from elsewhere? First brought in agency drivers when they had a similar problem in Penzance a few years ago. Of course, such solutions would cost WG money but then so might incurring the wrath of the TC. I wonder if we'll see temporary registration changes coming through VOSA in the next few days? Perhaps other operators or agencies have declined to help as they perceive a risk of not getting paid? Who knows? No one ever said running a bus compnay was easy. Not just a lack of a proper blind display but a plug for hiring a bus...... a service which, according to their website, they no longer offer and haven't done for some time. I'm really not sure how they are going to get out of the hole that they're in. If VOSA and the TC get on their case, plus the imminent competition coming from First, that's a heck of a lot of management time taken up, let alone continuing to resolve the current on-going problems and recruitment issues. It's not even as though First is hitting them at the start of the tourist season, they're doing it at the end and that's bound to hurt. First can ride it out but how deep are WG's pockets, given that they can't even provide working destination displays? I don't know if the journeys being cancelled are commercial or secured - if as WG say they are rarely or little used by passengers you have to wonder why they are running in the first place. Joking right? Proper bus companies don't chop and change their routes every few weeks! The details of First Kernows expansion into/over WG operational areas is now on the website along with a quote from First Director stating that more expansions are planned for Cornwall shortly. Sounds like they smell blood. I doubt Western Greyhound will be around this time next year. VOSA/Traffic Commisioner must be on WG case as well I would say.